Are you at the beginning of your search for your next car at Goshen used car dealers? Do you keep coming up short when you search Goshen used car dealers for a great selection of used cars for sale in Goshen, Indiana? Then you need to make your way over to the buy here pay here lots of USA-1 Auto Sales and check out our used cars for sale in Goshen, Indiana. At USA-1 Auto Sales, we have a large selection of vehicles at buy here pay here Goshen, Indiana used car lots. Whether you are looking for a used vehicle in the shape of a car, truck, minivan, or SUV, we have the right fit for you at the Goshen used dealers of USA-1 Auto Sales. Our sales team is ready to answer any questions you have and steer you in the right direction when choosing your next car. If a used Ford car is what interests you, we have a great selection of used Ford cars for sale near me to choose from at the buy here pay here lots near me of USA-1 Auto Sales. Like a used Ford Fusion SEL sedan for sale. This used Ford car for sale has a powerful 3.0-liter 6 cylinder engine that still gets an incredible gas mileage of 20 miles per gallon in the city and 28 miles per gallon on the highway even with the larger engine size and 221 horsepower. Convenience features such as power windows, power door locks, and cruise control can all be found on this stylish used car for sale at the buy here pay here lots of USA-1 Auto Sales. More features you won’t want to miss out on are the power tilt & sliding sunroof, steering wheel controls, and remote engine start. This used Ford Fusion also comes with safety features that will give your peace of mind as you drive through the streets of Goshen, Indiana. Like anti-lock brakes, multiple airbags, and child proof locks. 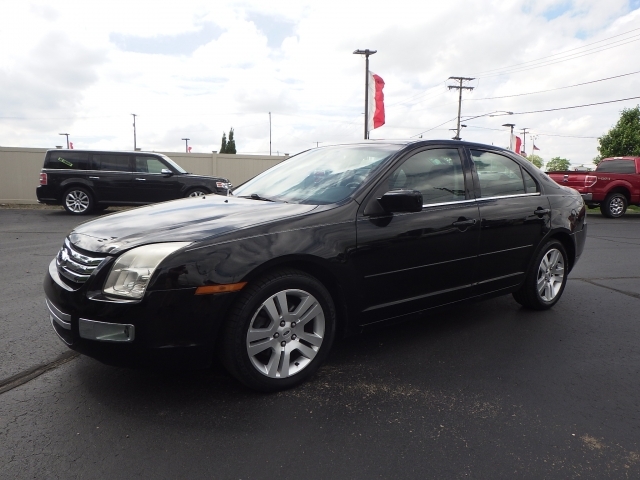 Come out to your buy here pay here lots of USA-1 Auto Sales to test drive this used Ford Fusion for sale today. Whether it is a used Ford car for sale, like this Ford Fusion, or one of our other used cars for sale near me, we have the perfect used car for sale for you at buy here pay here Goshen, Indiana car lots of USA-1 Auto Sales. We have a team of friendly and knowledgeable people who are happy to answer any and all questions you may have about one of the many used cars for sale near me. We proudly serve Goshen and Elkhart, Indiana, as well as Niles, Michigan and other neighboring communities with a great selection of used cars for sale near me, great deals, and outstanding customer service with a stress-free buying experience. Call today to schedule an appointment for a test drive at (574) 971-8484 or visit USA-1 Auto Sales in person at 501 West Pike Street in Goshen, IN 46526.